All right. I know I am prejudiced, but it seems to me that there is no finer place to be in October than Maine. (I can already hear the cries of protest coming from readers in other New England states.) Best of all is the light, which now comes in at a slant to make the landscape glow, and the changing leaves just add to the glory. Most of the humidity is gone, and on good days, the sky is a brilliant, cloudless blue. But along with the beauty comes loss. Gone are the hummingbirds, and Clif and I miss those whirring beauties. Yesterday, we took in their feeders and gave them a good scrubbing before storing them down cellar. We don’t hear the ethereal song of the hermit thrush anymore. In the summer, they tend to sing in the morning and evening. According to Audubon, the males are singing to defend their territory. Whatever the reason, it is an enchanting song that brings to mind little sprites playing their pipes. We no longer spend nights sitting on the patio, and in a week or two, we’ll be bringing in the tables and chairs. How lonesome the patio looks when it is empty! But yesterday the day was sunny enough and warm enough for us to have lunch on the patio. However, while some birds have gone, there are plenty that stay year round—the true blues, I call them. The jaunty chickadee is one of those hardier birds. And they, along with the finches, woodpeckers, and nuthatches, are hungrier than ever. It seems like we need to fill the feeders every two days. The gardens are pretty much spent. There are, of course, modest sedums, but they are overshadowed by the general droopiness of the rest of the plants. 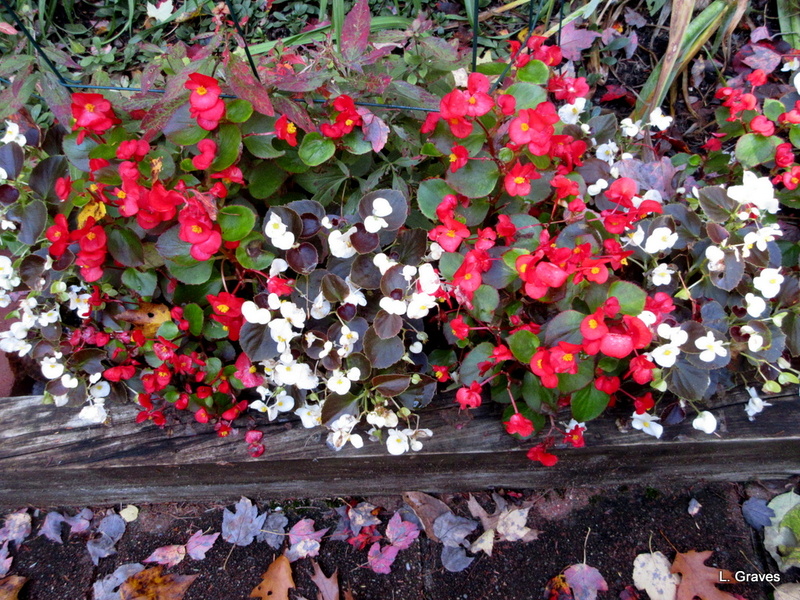 Then there are the begonias, those valiant bloomers that look good from late May through mid-October. Once upon a time, I was iffy about those flowers. Somehow they weren’t showy enough for my taste. How wrong I was! A annual that looks trim and pretty—in its understated way—for nearly five months? Who can ask for anything more? Having seen the error of my ways, next summer, I plan to go all out with begonias—along the edge of my garden, in pots, everywhere. Same over here in Wisconsin – lovely light and colors, same birds coming to the feeders. September and October are my favorite months, but there’s also the sadness of less daylight, empty decks, dying annuals, etc. We enjoyed watching a large spider on our patio door all summer, spinning and re-spinning her wide web. I named her Charlotte – how original, I know. She completed her lifespan in August, dying with her body wrapped protectively around her egg sac, and I mourned her. At the end of September the black-winged damselflies that had delighted us all summer, fluttering about like Harry Potter winged keys, also declined. And our hummingbird regulars perched on our deck railing one last time, looking into the window as if to say so long. Lovely, lovely comment. Do you have a blog? Didn’t see one with your comment. I used to, but haven’t for some time. I’m a lapsed writer. 🙂 Wrote a few books in high school and college of which my teachers liked excerpts, but they were more for my personal entertainment and I never cleaned them up. After college it was merely newspaper, local magazine and PR writing. I’m toying with book and blog notions again but kind of stumbling around in the dark. 😉 I turn 50 at the end of this year and want to make my next decade the one where I really accomplish things that matter. Happy birthday, a little early. Let me know if you decide to start blogging. I’ve learned to love the humble Begonia, too. They’re out there still pumping out flowers, while all around them are dead plants and pine needles. Gayle, you got that right. Let’s hear it for the humble begonia, whose beauty shines long after flashier flowers have faded and wilted. So they do. 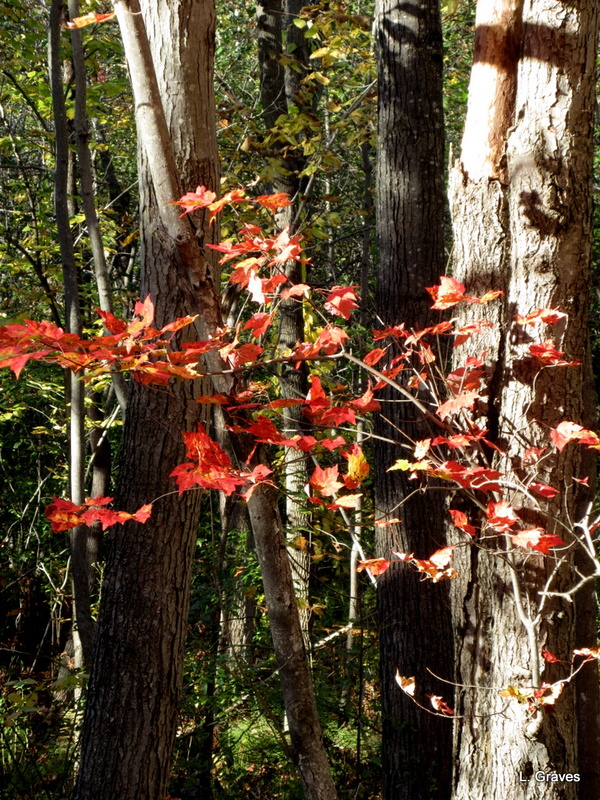 Although the pictures I took are up the road, and the leaves don’t come into our yard. No matter! Plenty of others do. 😉 For some stupid reason, I’ve never thought of putting begonias in a hanging basket. Do you use a special variety or just the ones you can buy in flats anywhere? I am a begonia convert. Better late than never. 😉 Another blogging friend says she puts them in hanging baskets, and I will try this next year. On another subject…your book arrived today. What a gem. I’ve already started dipping into it. Hope you sell lots and lots. Getting your book made my day. An excellent rallying cry too. 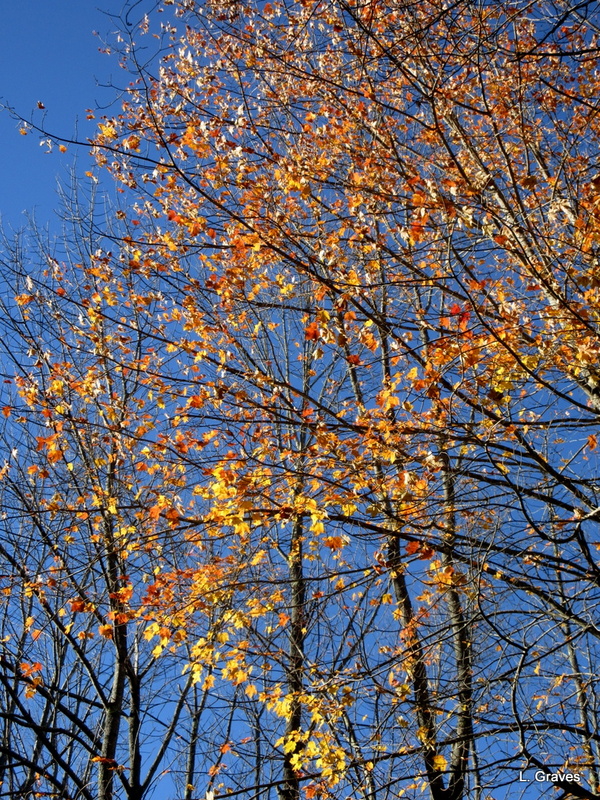 Love the blue sky behind colored leaves – THE poster of autumn to me. It feels like it is going fast, half of October is already gone…What?? Glad we have our birdie friends to keep us company through the cold months. They give life to the still, dormant landscape. That is a thoroughly sensible cry. You have painted a lovely picture of October in Maine, and the clear blue skies, clear air, and autumn leaves look beautiful. 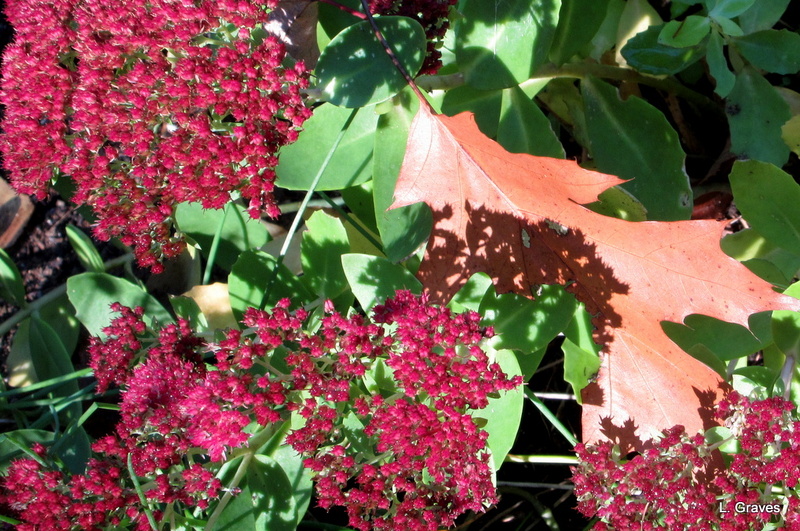 Autumn is my favourite time of the year…if it wasn’t for winter coming up! Begonias do well in many parts of Australia too, so they really deserve a cheer! That is the thing about fall…winter is coming. Also beautiful in Maine, but hard, too. A beautiful time of year isn’t it! Changes are coming quickly now and the temperature fluctuating. We are still cutting gardens back and collecting the last of the seed we need for propagation. A few quick trips away from home just to get out and explore this time of year. Today? Waterville…any must-visit suggestions? October is one of the best months in Maine. As for Waterville…on Front Street, by the Kennebec, there’s a fabulous new park. Nearby, on Common Street, a new chocolate shop. Across the street, on Main Street, a restaurant called Ital-iah that serves wonderful pizza. And, of course, Colby Art Museum, which has an amazing collection for such a small liberal arts college. Finally, don’t forget Railroad Square Cinema, which has movies starting around 3:00. One thing is certain: Watervillle rocks! These colors are simply glorious! 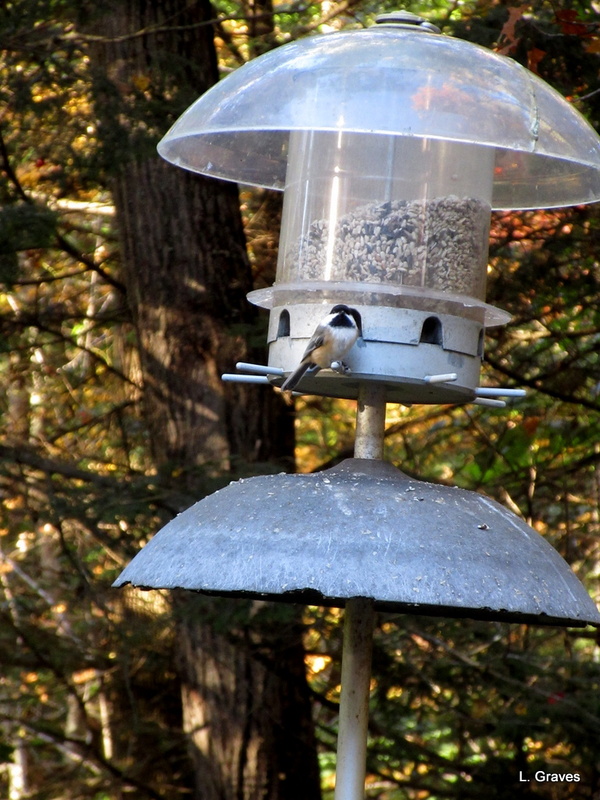 Lovely autumn photos and I love the little chickadees who also keep us company through the winter. We were working in the yard today and have noticed the absence of the hummingbirds and a return of the blue jays. I love this time of year and wish it could last a little longer. I know. A beautiful time of year. But the absence of birds, butterflies, and certain insects—not mosquitoes!—make me sad. Yup–it’s definitely fall. We had to move the TV off our big glassed-in porch to the living room so we could watch the Red Sox last night! It’s so beautiful outside but downright chilly! We now must use heat every day. Takes some getting used to, but I think Clif and I are in the swing of fall. Maybe you can convince Judy to like Begonias. I also miss the migrating birds, and am thankful for those who stay – especially cardinals! It took me a long time to like begonias, but now I’m in all the way. Next year, it will be begonia central at our home in the woods. Yes, we miss those migrating birds. They mention Maine a lot – and of course I think of you Laurie! This is a most beautiful time of year. It does seem quiet and empty without all the summer birds and insects. It surely is beautiful, and a little sad, too. Old England is indeed very beautiful. We have no luck with sunshine these days.